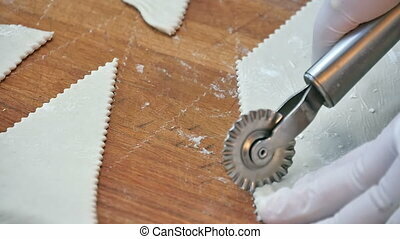 Food preparation, ravioli cutter. hands making food close up. 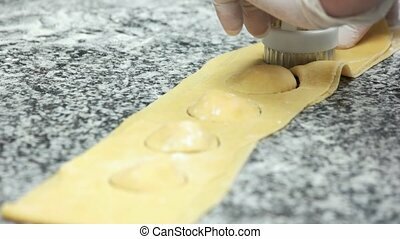 Cutting dough with roller knife for ravioli on table. Top view. Professional shot in 4K resolution. 084. You can use it e.g. in your commercial video, business, presentation, broadcast video. 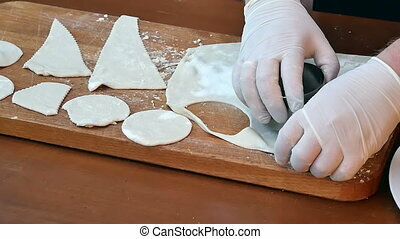 rolling dough and making dumplings. Cutting dough into circles. Close up. Slow motion. Professional shot in HD resolution. 084. You can use it e.g. in your commercial video, business, presentation, broadcast video. Cut out circles from raw cookie dough rolled seam on a wooden board. Close up. Slow motion. Professional shot in HD resolution. 084. You can use it e.g. in your commercial video, business, presentation, broadcast video. Cooking homemade dumplings with seafood. Close up. Slow motion. Professional shot in HD resolution. 084. You can use it e.g. in your commercial video, business, presentation, broadcast video. Cutting dough with roller knife on table. Close up. Slow motion. Professional shot in HD resolution. 084. You can use it e.g. in your commercial video, business, presentation, broadcast video. Hands using ravioli cutter. 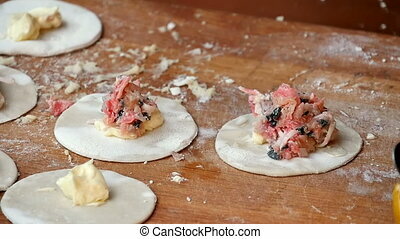 Food preparation, stuffed dough. 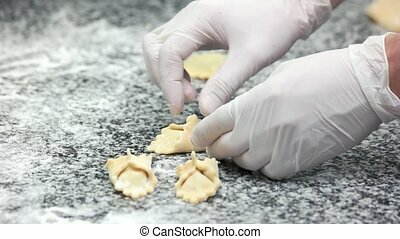 Chef using ravioli cutter. Raw dumplings close up. 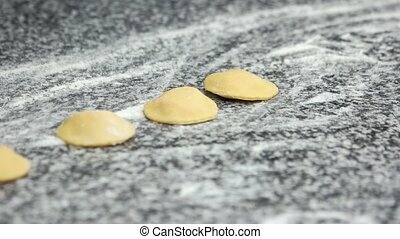 Ravioli preparation top view. Hands of chef adding sauce. Ravioli dough close up. 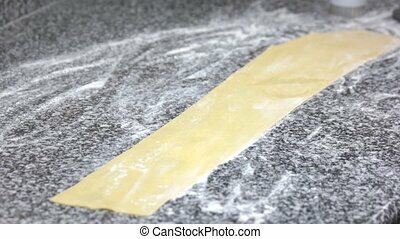 Food preparation, pasta ingredient. 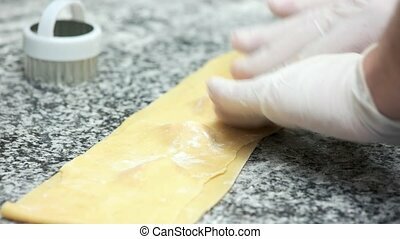 Hands of chef making ravioli. 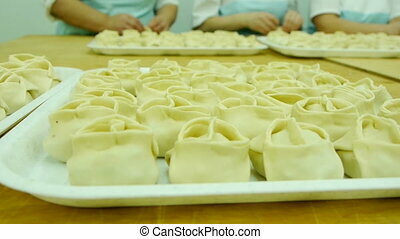 Food preparation, pastry. 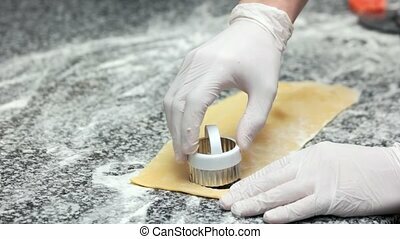 Chef making ravioli close up. Food preparation, dough. Ravioli dough and cheese. 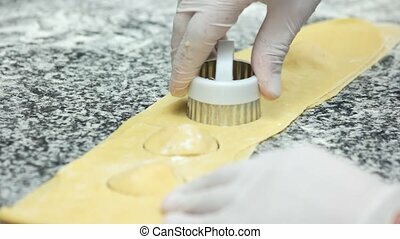 Italian pasta preparation. 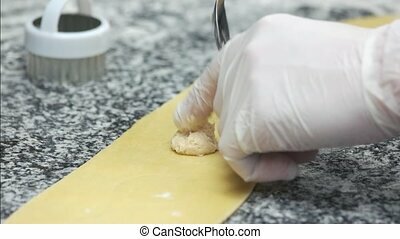 Chef using ravioli stamp. 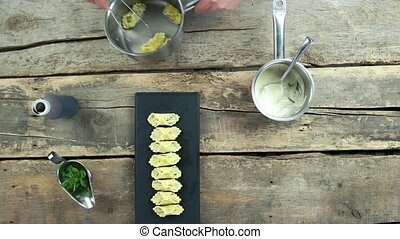 Italian dumplings preparation. 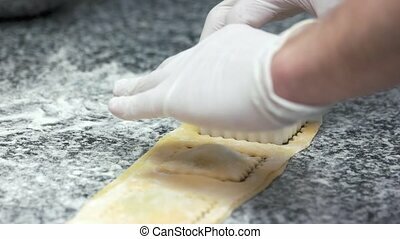 Hands making ravioli. Raw pastry close up. Raw ravioli close up. Dough and flour. 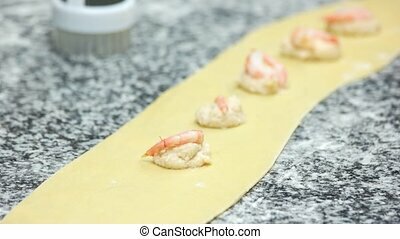 Ravioli dough, shrimps and cheese. Dumpling ingredients close up. 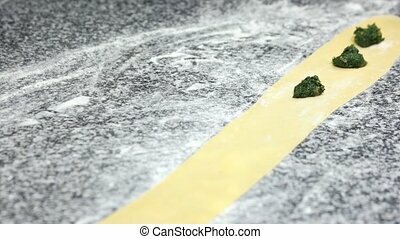 Dough and spinach. Ravioli preparation close up. Dough, cheese and shrimps. 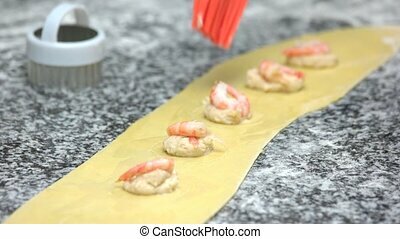 Seafood ravioli preparation. Dough, shrimps and cheese. Ravioli ingredients close up. Woman baker cutting pieces from dough. Raw dough for baking. 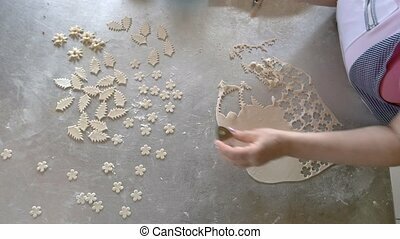 Preparation of pastry at bakery.